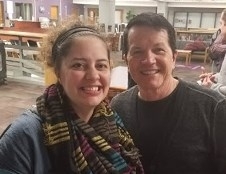 Brooke Carlson with Bill VanPatten of Tea with BVP and Keynote Speaker at the Minnesota Council on the Teaching of Languages and Cultures Annual Conference. Carlson’s class is strategically arranged to make space for large and small group interaction. The tables and chairs are pushed to the edges and line the walls to make an open and comfortable space for students to stand, sit and even, according to Carlson, dance. All for the express purpose of speaking Spanish. With a youthful energy rivaling that of her students, Carlson’s learning objectives focus on proficiency; in the redesigned classroom “students are able to practice what they are learning rather than relying on textbooks and traditional assessments…they come to know themselves as Spanish speakers because they are speaking Spanish.” Given the increase of Spanish speakers in our world, developing the communication skills and confidence to speak Spanish is imperative for Mahtomedi students. ¡OK, TODOS, LEVANTENSE! ¡PIE A PIE! Growing bodies of research demonstrate that second language acquisition is best learned in the same way as first languages – organically. Just as infants learn their first language by listening, inferring and participating in a community of speakers so too goes second language acquisition. The physical space and nearly 100% immersion in Carlson’s class (she only speaks Spanish) is intended to mimic how first language is learned. Carlson has been teaching this way for four years and with the positive results she was ready for more training. So, last year Carlson enrolled in an OWL (Organic World Languages) conference but the Middle School budget was unable to cover the cost. OWL is an organization that is dedicated to student-centered, proficiency-based instruction, interaction and hands-on activities. Their training equips teachers to create organic learning opportunities for their students and so MAEF and the Hansen Inspired Teacher’s Grant was pleased to provide the balance of funds. MAEF’s funding is an integral resource for teachers like Carlson who are committed to educating our students to be ready and able global citizens.